The identical spacecraft, Voyager 1 and Voyager 2, took off in in August and September 40 years ago and were programmed to pass by Jupiter and Saturn on different paths. Voyager 2 went on to visit Uranus and Neptune, completing NASA’s “Grand Tour of the Solar System,” perhaps the most exhilarating interplanetary mission ever flown. CU Boulder scientists at LASP, who designed and built identical instruments for Voyager 1 and Voyager 2, were as stunned as anyone when the spacecraft began sending back data to Earth. The discoveries dazzled scientists and the public: 23 new planetary moons at Jupiter, Saturn, Uranus and Neptune; active volcanoes on Jupiter’s moon, Io; Jupiter’s ring system; organic smog shrouding Saturn’s moon, Titan; the braided, intertwined structure of Saturn’s rings; the solar system’s fastest winds (on Neptune, about 1,200 mph); and nitrogen geysers spewing from Neptune’s moon, Triton. Forty years later, the two spacecraft are still traveling—about a million miles per day. Although both are still in contact with scientists at the Jet Propulsion Laboratory in Pasadena, California, which is managing the mission for NASA, Voyager 1 is roughly 13 billion miles away and has punched its way into interstellar space. Voyager 2 is not far behind but on a different trajectory that will soon take it out of the cosmic neighborhood. The LASP photopolarimeter subsystem (PPS), a telescope that measured the intensity and polarization of light at different wavelengths, was used for a variety of observations. It helped scientists distinguish between rock, dust, frost, ice and meteor material. It also observed the structure of Jupiter’s Great Red Spot and the properties of the clouds and atmospheres of Jupiter, Saturn, Uranus and Neptune, as well as Saturn’s largest moon, Titan. The huge surprise at Jupiter’s moon, Io—that a moon the size of Earth’s could have 10 times the volcanic activity of our home planet—still astonishes scientists today. Esposito, who chaired the Voyager Rings Science Working Group from 1984 to 1989, said density waves—ripple-like features in the rings caused by the influence of Saturn’s moons—allowed the team to estimate the weight and age of Saturn’s rings. Careful study indicates they might be as old as the solar system itself, said Esposito, who also is the principal investigator on a $12 million CU Boulder instrument package aboard NASA’s Cassini mission to Saturn, launched in 1997, which is scheduled for a successful but fiery end on Sept. 15. 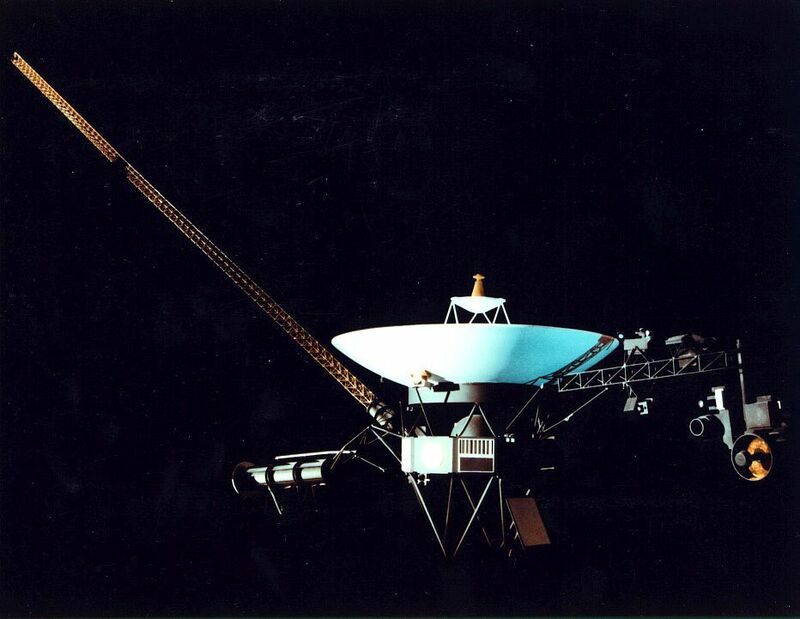 Charlie Hord, a former planetary scientist at LASP, remembers the heyday of Voyager. Hord, principal investigator for a time on the Voyager spacecraft LASP instruments, shook his head in wonder as he recalled some of the discoveries. In 1990, Voyager 1 turned around one last time and took a portrait of the solar system—a sequence of photos that revealed six of the nine planets in an orbital dance. From nearly 4 billion miles away, Earth took up only a single pixel. Over its lifetime, the CU Boulder PPS science team also included LASP’s Karen Simmons and Robert West. Other LASP scientists working with data from other instruments on Voyager include Mihály Horányi, Nick Schneider, and former CU Boulder faculty member David Grinspoon. The mission also involved contributions from a number of CU Boulder undergraduate and graduate students. On the off chance either spacecraft encounters another civilization, each is carrying what are known as the Golden Records—gold-plated copper phonograph records with greetings in 54 languages; the sounds of surf, wind, thunder, birds and whales; analog photos of people and places on Earth; diagrams of DNA; and snippets of music ranging from Bach and Beethoven to Chuck Berry. Berry even played Johnny Be Goode on his guitar on the steps of JPL during the 1989 Voyager 2 Neptune encounter. The spacecraft carries a stylus set up in the correct position so that aliens could immediately play the record, named “Murmurs from Earth” by the late Carl Sagan, who conceived the Golden Record effort. In 40,000 years, Voyager 1 will float within 9.3 trillion miles of the star AC+793888 in the constellation Camelopardalis. In 296,000 years, Voyager 2 will pass within 25 trillion miles of Sirius, the brightest star in the sky. Perhaps on the way, the spacecraft will encounter some musically inclined aliens up for a little Bach, Beethoven, or Berry. A PBS special titled The Farthest: Voyager in Space first aired on public television Aug. 23 and will air again on Sept. 13. This article originally appeared in CU Boulder Today: http://www.colorado.edu/today/2017/08/31/voyager-spacecraft-40-years-space-surreal-solar-system-discoveries.